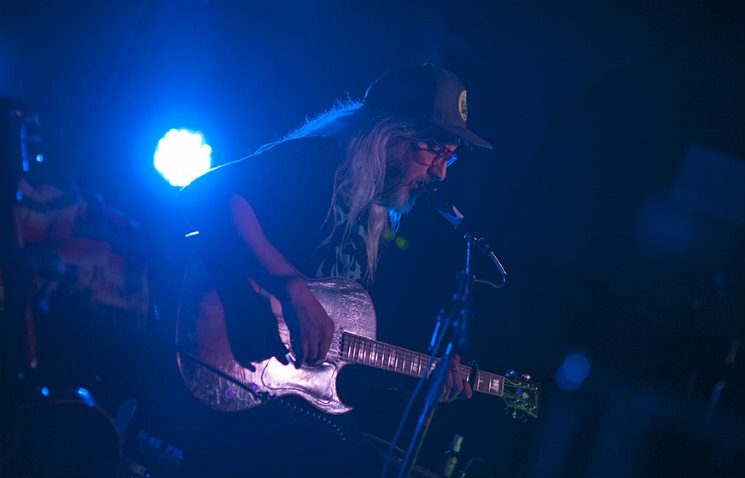 Known as one of the greatest guitarists of all time, J Mascis provided fans with a chance to experience his expert playing in an intimate live setting last night (June 4), bringing his solo acoustic tour to the nation's capital. Opening the show, Matt Valentine, seated behind a crowded rack of effects pedals, delivered an unremitting 45-minute set of sonically loose but expertly focused psychedelic folk. Valentine, who also opened Dinosaur Jr.'s last Ottawa appearance as a member of MV & EE, moved from acoustic to electric guitar and banjo, providing the oft-perplexed audience with a multi-coloured wall of sound that was accompanied by his unique sprechgesang vocal styling. A quick change found J Mascis seated close to the edge of the stage surrounded by a mini amp cabinet, tightly placed sound monitors and yet another rack of effects pedals. Armed with only two acoustic Gibsons, Mascis opened the show with faithful renditions of "Listen to Me" and "Me Again" — opening tracks from his respective solo albums — before ripping into "Little Fury Things," indicating to the audience that he'd be performing stripped-down versions of Dinosaur Jr. tracks. Sprinkled in with his solo material and a stunning cover of Mazzy Star's "Fade Into You," Mascis re-worked Dinosaur Jr. classics like "Get Me" and "Out There" before launching into some of his band's deep cuts, like "Not the Same," "Flying Cloud," "Alone" and "Not You Again." Looping his guitar parts, Mascis was able to fill out most of his songs with distortion-laden guitar solos (most notably the six-minute raga-influenced bridge to "Heal the Star"), giving the audience an intimate look into his increasingly inventive and masterful guitar playing. Coming out for a single-song encore to perform the Cure's "Just Like Heaven," Mascis muttered a simple "Thank you," a humble and understated gesture from one of our time's guitar gods.